Senior advisor to the president of the Knight Foundation Eric Newton has received the Markoff Award for the Foundation’s support of investigative reporting. The Knight Foundation has invested more than $100 million (£63.2m) in reporting technologies and techniques since 2007. Knight Foundation has invested some $20 million in investigative reporting projects. They range from establishing an endowed chair, supporting professional and training organizations, establishment of university-based investigative reporting projects, funding for specific investigations and direct support for independent nonprofit investigative reporting newsrooms. Knight’s most recent investigative reporting grant was announced last week – $800,000 to the Center for Investigative Reporting to work with the Investigative News Network to launch an investigative reporting channel on YouTube. The Markoff Award is named after New York Times journalist John Markoff. This entry was posted in Investigative journalism, Online Journalism and tagged Awards, Eric Newton, investigative journalism, Knight Foundation on April 16, 2012 by Tabby Kinder. 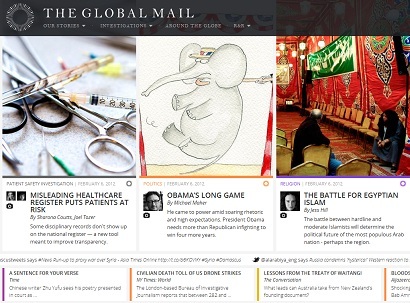 A new investigative journalism site is today marking the launch of its “field trial”, during which time it will test the platform and carry a selection of articles “to give people an idea of what is coming”. 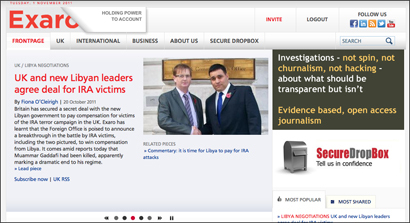 ExaroNews aims to “hold power to account” and will launch as a fully-fledged, paywalled investigative news site “in a few weeks”, with a focus on appealing to readers in the business community, Mark Watts, the site’s editor told Journalism.co.uk. The new organisation plans to encourage WikiLeaks-style whistleblowing, hoping those with a potential story will contact the Fleet Street-based editorial team or leave the documents in an anonymous drop box, which will launch at a later date, Watts explained. The server is physically located outside of the jurisdiction which means it makes it much safer in terms of attempts to find out who has passed information on. As well as hoping to have leaked documents to investigate, the team of mainly freelance journalists will spend the majority of time “crawling public data for stories that are generally going missed”. The journalists will be “investigating governments in the widest sense of that word, investigating public bodies and what they are up to” by analysing the “increasing volume of public data available”, Watts said. Journalists working for a mainstream media title don’t really have the time to assess and make sense of that data. The growing team of journalists working for the organisation includes “people who have worked on both broadsheet and tabloid newspapers, people who have worked in broadcasting and people from trade magazine backgrounds”, Watts told Journalism.co.uk. One of those is former Westminster correspondent for the Guardian David Hencke, he said, plus there are “those who are much fresher out of journalism college, particularly those who have learned a bit about data journalism and a bit about how to make use of information that is put in the public domain by an array of public bodies”. Watts himself ran the investigations unit at the now-defunct Sunday Business, and has worked on the Sunday Times and on TV programme World in Action. One of the stories currently on the site is on negotiations between the new Libyan government and the UK, which, according to Watts, was later reported in the Sunday Times. Former Guardian journalist David Hencke has a series of stories on the site “how auditors found crazy examples of misspending by all sorts of Whitehall departments and all this was gathered from audit reports that were in the public domain but had not been picked up on”, Watts said. Paywall prices have not yet been set and readers will be able to access the site by paying for a subscription or can opt to micro-buy articles, Watts explained. The site is particularly, but not exclusively, aimed at a business and City audience, simply because we think that that’s probably where the paying audience will be, as distinct from the general consumer, which has got used to the idea of having content for free. Once the paywall is launched readers will see a homepage with introductions to articles and will be then prompted to micro-buy or subscribe. Investigative journalism does cost money and although people are getting used to the idea of getting news content for nothing, of course what they are often getting for free is just regurgitated, rehashed, or, to use that phrase, churned material which its no wonder is free as really it is pretty valueless. ExaroNews is holding a launch party this evening (1 November). This entry was posted in Business, Investigative journalism, Online Journalism and tagged exaronews, investigative journalism, mark watts, paywall, Whistleblowing on November 1, 2011 by Sarah Marshall. Image by openDemocracy on Flickr. Some rights reserved. Yesterday’s New York Times editorial was devoted to the case of murdered Russian journalist Anna Politkovskaya. 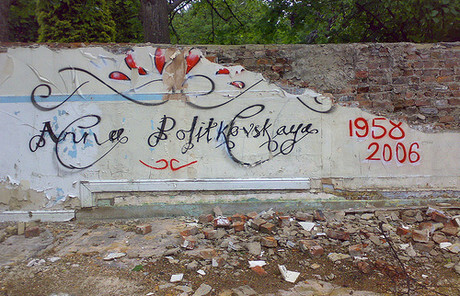 Politkovskaya, who became known for her fearless investigative reporting of social issues in Russia and human rights abuses in Chechnya, was killed in her apartment building in 2006. Five years on, no one has been convicted of her murder. At the time of her murder, Vladimir Putin, who is now the prime minister but was the president then, dismissed her journalism as “insignificant” and said that nobody “currently in office” could possibly have organized a crime that, he said, was committed “to create a wave of anti-Russian feeling.” To many Russians, that sounded like orders from the top that police or judges or prosecutors should take care not to accuse anyone in power. This entry was posted in Investigative journalism, Legal, Newspapers, Press freedom and ethics and tagged Anna Politkovskaya, New York Times, press freedom, Russia on September 14, 2011 by Joel Gunter.